Wisconsin Sports Blog: Lights. Camera. NASCAR! 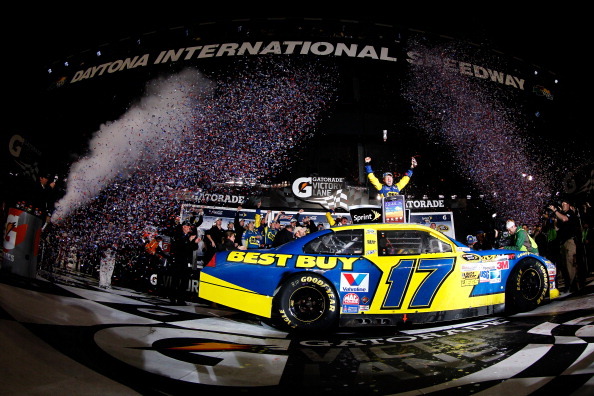 Matt Kenseth celebrates his 2nd career Daytona 500 victory, amidst an odd race. Nearly 40 hours of delays, rain, fire, and a green white checkered finish, pretty much sums up this years Daytona 500 ran under the lights. This was a race for the records books. With one of the most anticipated debuts in the last decade in rookie Danica Patrick, who finished the race in 38th place, but that's not the moment of the night . On lap 160 while under caution, Juan Pablo Montoya, driver of the 42 target car, tried to make a lap up on the pack. While doing so, on turn three, Juan described a breaking sound, and seconds later, was in the rear of one of the jet dryers that was clearing debris. This resulted in what could best described a glimpse of hell (see below.) Montoya's car on impact was quickly engulfed in a ball of fire, which was only momentary. After he came to a complete stop, Juan was quick to leave his car, as well as the driver of the jet drying truck. Not long after a spark set over 200 gallons of jet fuel ablaze. Drivers of both cars were on there way to an ambulance to take them to a nearby medical center during this time, and were eventually cleared. After a nearly 2 hour delay, and a quick fix of a powdered laundry detergent, the race was back underway. 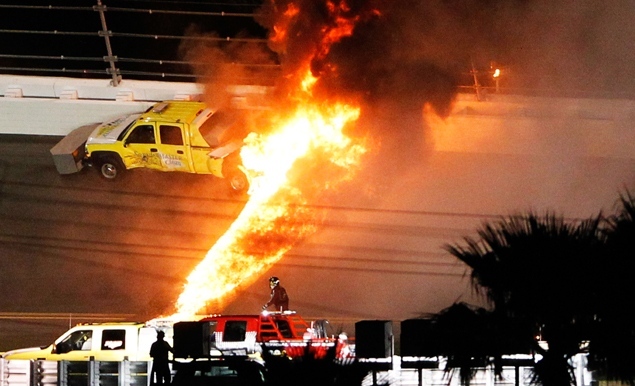 200 gallons of jet fuel burst into flames after Juan Pablo Montoya's car collided with the jet dryer truck on Turn 3. And even a clean finish was not possible, with a green, white, checkered finish needed. Matt Kenseth, (Cambridge,WI native), had the lead at the time of the last caution. After holding off Greg Biffle and Dale Earnhardt Jr, Kenseth became the winner of the 56th Daytona 500. It was his second win in the famed race in the last 4 years, also winning in 2009. Kenseth's pit crew was pivotal in his victory. With the crew working at the speed they did, they were quick in and out of the pits during cautions, leading a comeback all the way from the 32nd position. With a quick lead in points, Kenseth looks to keep momentum rolling into next week at Phoenix International raceway where he has one career win. If this years Daytona 500 is any indication of this race season, it will be an interesting one to say the least.